Being a person that is just starting crocheting under the circumstances, I'm having fun trying new things,. I'm still working on my afghan, but, it's a work in process. I had to wait until the yearn was delivered to continue. So, I decided to teach myself how to make a hat. I'm sorry, but I can not follow crochet patterns. I get lost in all the initials. So, I decided to wing it. There were a couple of false starts but here's what I ended up with. I may have to start wearing hats. The top one i just kept trying different stitches and increasing and reducing number of stitches. The white one on the right is not completed. The one on the bottom is made out of cotton yarn and I think it's going to stretch out and stay that way... that was a good lesson, use stretchy yarn. 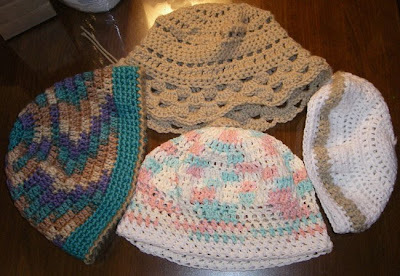 Only 3-4 more weeks to go for being away from home so I'm curious to see if I continue crocheting at home.